The LWPS was held on board the luxury cruise liner MV Leisure World, for the last 20 years one of the region's favourite cruise-to-nowhere destinations. The LWPS is conducted in the Treasure Cove, which serves as a dedicated poker room during event days. The Treasure Cove has an attendant bar, a tournament registration ticketing system, ample rest facilities, as well as multiple LCD displays with cable TV connectivity. 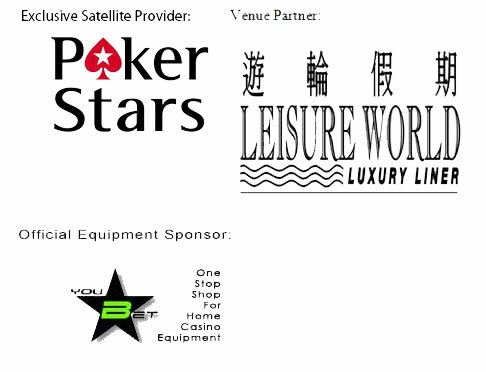 During LWPS weekends, the venue also conducts Texas Hold'em cash games, and Sit N Go tournaments upon demand. The Series, which enjoyed a popular run from 2010 - 2015, has since been rebranded as the Singapore Poker Championships, taking place on the LW's sister vessel Amusement World. Visit our comprehensive MV Leisure World FAQ for answers to all your boarding related questions. Updated ferry schedules can be found here. The complete Season 6 schedule is out! Mark these dates on your calendars! Talk about the LWPS in our forums. Check out our archives for past event reports, pictures and videos!